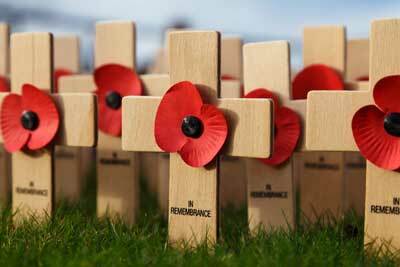 Memorial Day is, officially, a solemn day of remembrance for everyone who has died serving in the American armed forces. Unfortunately, it has also become the three-day-weekend beginning of the summer holiday season. In 1968 Congress passed the Uniform Holiday Act which established five Monday holidays for federal workers. When the act became effective in 1971, Washington’s birthday, Memorial Day, Labor Day, Columbus Day and Veterans’ Day holidays all became three-day weekends. In May of 1868, General John A. Logan, leader of an organization for Northern Civil War veterans, called for a nationwide day of remembrance: “The 30th of May, 1868, is designated for the purpose of strewing with flowers, or otherwise decorating the graves of comrades who died in defense of their country during the late rebellion, and whose bodies now lie in almost every city, village and hamlet churchyard in the land.” The date, according to some, was chosen because it was not the anniversary of any specific battle. However, Decoration Day observances continued to occur on various dates throughout the country. After World War II the holiday gained a strong following and a more national identity. 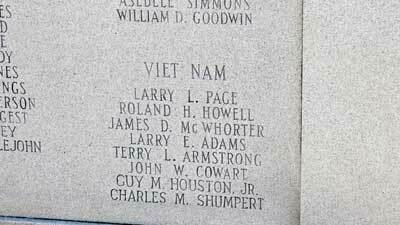 It was officially named Memorial Day in 1967. In 1975, an act of Congress returned the Veterans’ Day holiday to its traditional November 11th date. Because the three-day Memorial Day holiday weekend has largely become known as the “unofficial” beginning of the summer holiday season, much of its original purpose is lost on many people. Accordingly, there have been many voices calling for Memorial Day to be returned to its traditional May 30th date. To this end, Hawaii’s Medal of Honor-winning Senator Daniel Inouye, every year from 1989 until his death in 2012, introduced legislation to remove Memorial Day from the Uniform Holiday Act. To honor the original purpose of the day, many across the USA attend community-wide Memorial Day celebrations, with parades and other ceremonies, often including military personnel and members of veterans’ organizations. The audience gathering before the Blue Mountain Memorial Day celebration. Soloist Riley Bennett, Jr. sang. Congressman Trent Kelly speaking during Blue Mountain Memorial Day ceremony. 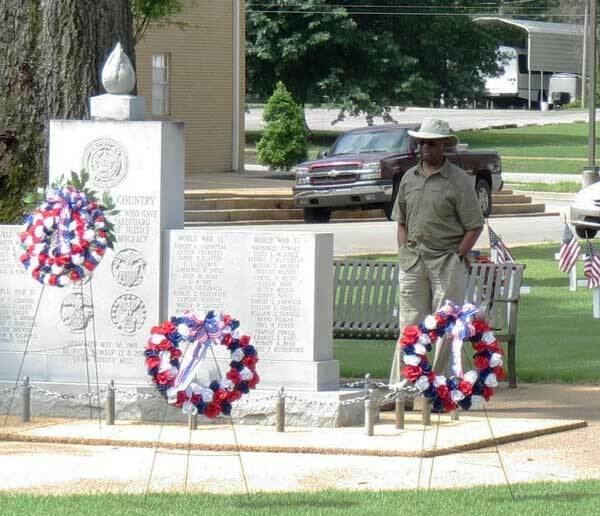 Congressman Trent Kelly and Blue Mountain Mayor Doug Norton placed a Memorial Day wreath. Piper Eric Holloway played during placement of the wreath. About 70 people gathered for a Memorial Day ceremony Sunday afternoon, May 27, 2018, at Blue Mountain’s City Park. Blue Mountain Mayor Doug Norton presided at the event. Third and fourth grade students lead the Pledge of Allegiance. First District U.S. Congressman Trent Kelly was the speaker. He was introduced by retired Brigadier-General Joe T. Gay. A four-member Mississippi National Guard color guard raised the flag. The color guard participated as Mayor Norton and Congressman Kelly placed a Memorial Day wreath. Bag Piper Eric Holloway played as the wreath was placed. Gunnery Sergeant Bert Conley, USMC, played taps to close the ceremony. Other Americans, like Lee Howell, choose more solitary rituals-visiting cemeteries or war memorials, remembering specific loved ones and/or honoring the many members of the military lost in many battles. 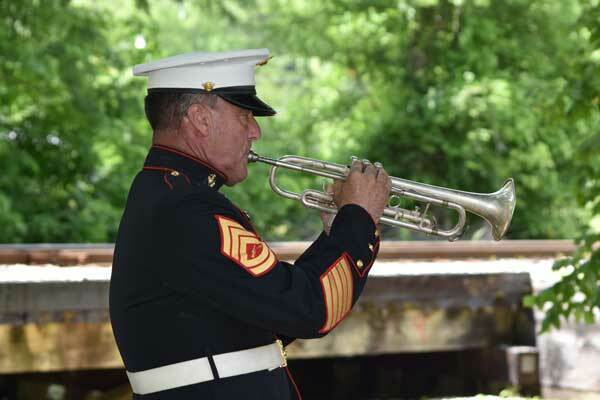 Gunnery Sergeant Bert Conley, USMC, plays taps at Blue Mountain.